“A monthly Rs. 5,000/- SIP will make you a crore-pathi!” Screamed a Facebook ad. Really? Is it that simple? Lets break it apart and find out the assumptions baked into that bold assertion. 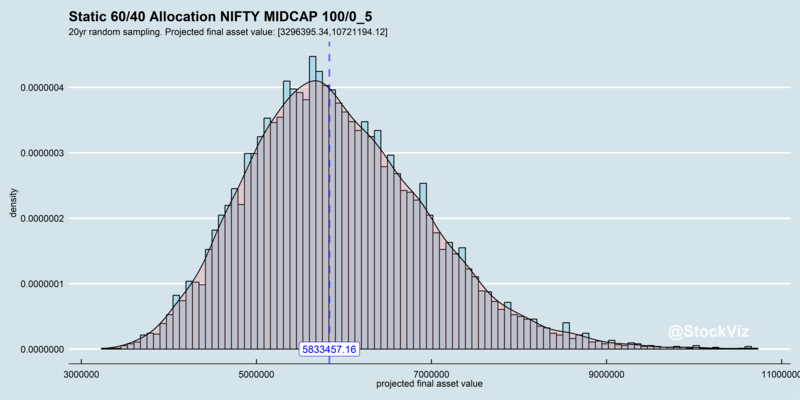 The NIFTY MIDCAP 100 index has given an annualized return of ~21% between 2002 and 2016. 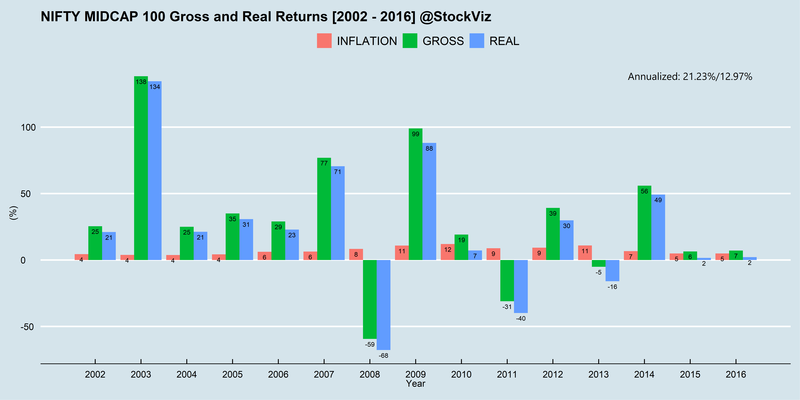 If you assume a 20% return over the next 20 years, then a monthly SIP of Rs. 5,000 will indeed result in a Rs. 1,21,94,282/- corpus, making you are crore-pathi. One way to mitigate blow-up risk is to diversify away from equities into bonds. A popular allocation scheme is the 60/40 equity/bond allocation. So how much should you expect a 20 year, Rs. 5,000/- monthly SIP to return under this scheme? 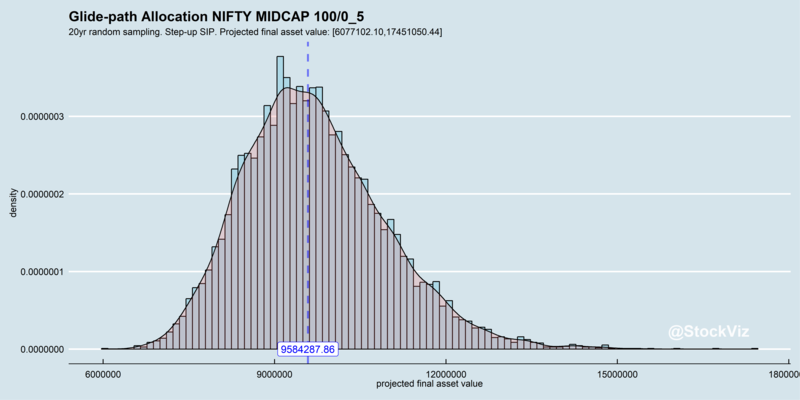 It is a range of returns because it looks at a 10,000 random samples of 20×12 monthly (historical) returns to reflect the path-dependency of SIPs. Now, what about the size of the final corpus under this scheme? On average, you should not expect more then Rs. 60 lakhs as the final corpus under a static 60/40 allocation scheme. 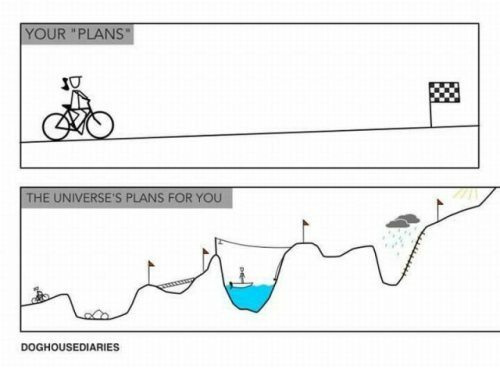 You could get unlucky and end up with Rs. 30 lakhs or get very lucky and end up with Rs. 1 crore. 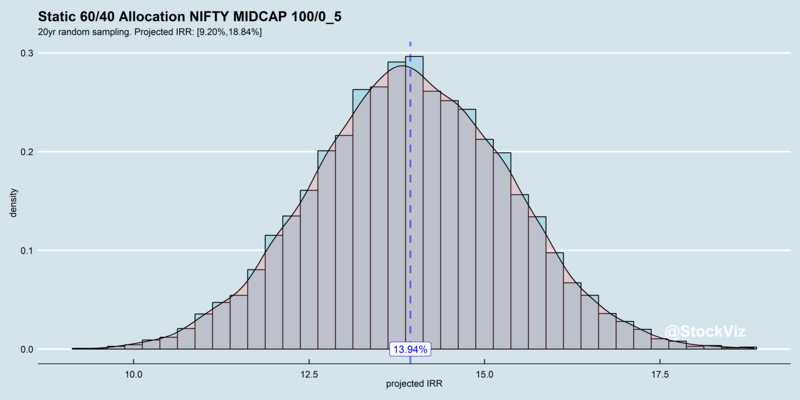 But this is the expected range of returns. If you still want to get to the magic one-crore mark, you will have to “step-up” the SIP contributions. And what if you stepped it up? The kind of “straight-line” thinking that the ad propagates will set you up for disappointment if you don’t understand the underlying assumptions that went into it. Prudent asset allocation is much more than raw performance. It is making sure that you will have the money when you need it. And it inevitably compresses returns, so it requires you to save more. Allows the allocation to drift by 5% before triggering a rebalance. Assumes a 10% tax on returns at every rebalance. “0_5” is the total return index of the 0-5 year government bond. 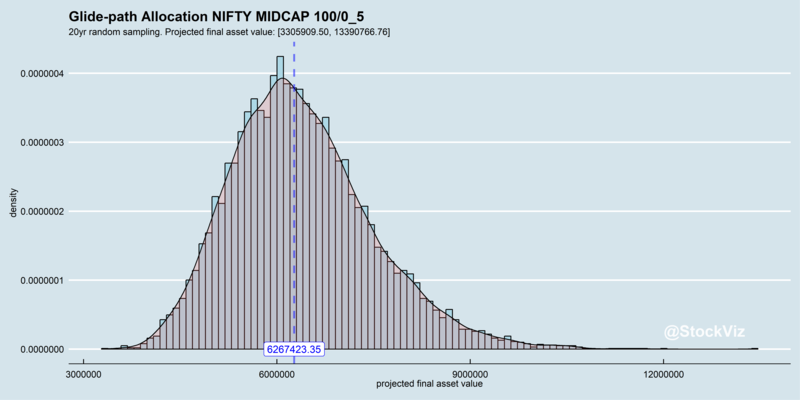 Code and additional charts (with returns using the NIFTY 50 index) are on github.